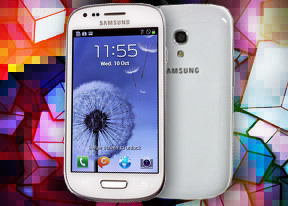 The Samsung Galaxy S III mini comes with Android 4.1 Jelly Bean and the latest TouchWiz UI, dubbed Nature UX. It's the premium combination that we saw on the Galaxy SIII and the Galaxy Note II and it undoubtedly lifts the stock Android user experience. The lockscreen is a standard "tap and drag in any direction to unlock" affair and there're ripples accompanied by water-drop sound as you drag your finger. Samsung has provided four customizable shortcuts at the bottom of the screen - drag one up to activate the specific app. In case of missed calls or incoming messages for example you can drag to unlock the device and directly launch the call log or the messaging app. As usual, you can pinch to zoom out and easily manage homescreen panes - add, delete or just reorder them. You can have 7 panes at most, which are enough to fit plenty of content even if you use widgets that cover an entire pane. The notification area offers quick toggles for Wi-Fi, GPS, Silent mode, Screen rotation, Power saving. Only five toggles fit the screen at a time, but you can scroll them sideways to reveal more functions - Notifications (toggles icons in the top row of the screen), Mobile data, Bluetooth, Driving mode and Sync. The app drawer has a tab that lets you pull out widgets straight to the homescreen. Unlike stock Jelly Bean, you cannot move between tabs by swiping through the pages - you have to explicitly hit the widgets tab. Some will find this more logical (scrolling past the available apps to find yourself in the widgets takes some getting used to). The app drawer has three view modes - Customizable grid (where you can freely rearrange icons), Alphabetical grid (if you think you can find apps quicker when they're ordered alphabetically) and Alphabetical list (this one makes shortcuts easy to hit, but isn't very space efficient). You can also view just the downloaded apps by hitting the Downloaded apps icon. Jelly Bean comes with various widgets and Samsung have added even more. Some widgets are resizable too - a feature we've seen in some custom UIs is now available natively in Jelly Bean. Once you get several apps running, you can use the task switcher to go back and forth between them. It's an Jelly Bean-style vertical list with a screenshot and a name for each app. Swiping an app sideways removes it from the list. Overall, the Nature UX dressing on top of Android 4.0.4 looks great and the Galaxy S III mini does pack a lot of the features of its flagship. It's rare to see a compact device having most of the bells and whistles. And despite the lack of a quad-core Exynos chipset, the dual-core Galaxy S III mini handles the heavy Samsung skin equally well. It didn't even experience that much difficulties with a heavy live wallpaper on and we have no doubts it'll be even smoother come launch. The Samsung Galaxy S III mini features the NovaThor U8500 SoC, which features a dual-core Cortex-A9 processor, clocked at 1 GHz. Graphics are handled by the single-core Mali-400 GPU and there's 1GB of RAM available. Keep in mind that the benchmark scores are likely to improve ahead of release. So without further ado, let's kick off with BenchmarkPi, which test the per-core CPU performance. Linpack came up next to put the dual-core CPU of the NovaThor U8500 chipset to the test. The Galaxy S III mini scored a respectable 60.3 MFLOPS, but still trailed behind some of the competition. Moving on to the other web performance benchmark, BrowserMark tests how up-to-date is the S III mini with the latest web standards. The Galaxy S III mini managed to beat the similarly spec'd Galaxy S Advance due to its newer Android version. The HTC One S and Galaxy S II had the upper hand, however. The Samsung Galaxy S III mini packs a single-core Mali-400 GPU, which achieved 31.9 fps in NenaMark 2. That's by far not the most impressive score we've seen, considering the WVGA resolution, but it still suggests playable framerates on most occasions. Unfortunately, we have AnTuTu benchmark data only for quad-core smartphones, but we decided to see how the Galaxy S III mini fares here as well. So the Galaxy S III mini can't compete with the most powerful chipsets currently on the market, but it fares pretty well in the mid-range. The Galaxy S III mini isn't made to be a computing powerhouse, but rather a trusty companion in everyday tasks and it seems capable of delivering there.